Your office ceiling doesn't have to be drab grey paneling. Here's how to turn your ceiling into your fit out's finest feature. If you type ‘typical office ceiling’ into Google, you’ll be faced with familiar images of grey grid-style ceiling panels. These ‘dropped ceilings’ are actually false ceilings. They’re used to conceal pipes and electrics to make the ceiling space neat, whilst those services are still accessible. They help to improve acoustics by absorbing sound and improve air quality by providing ventilation; but what if you can achieve these things with an alternative that is less mundane? What if you could install or restore a ceiling which is anything BUT a typical office ceiling? We look at some cool alternative ceilings that could help your new office fit out look and perform even better! 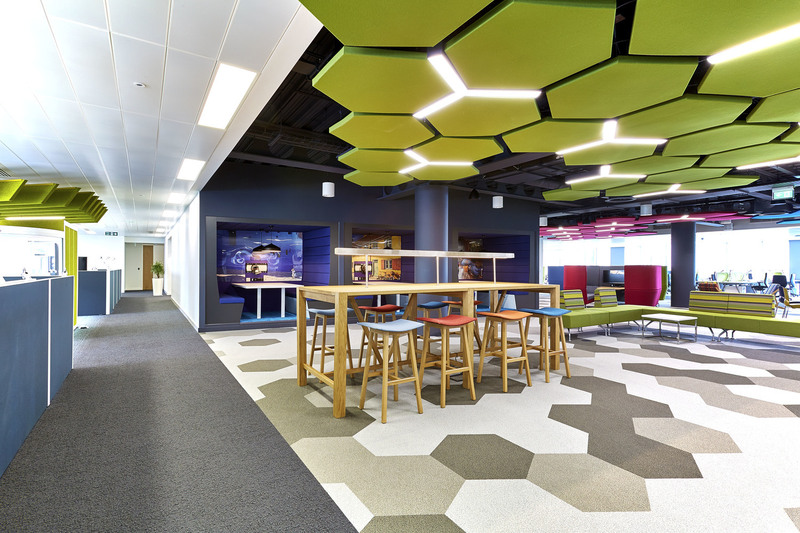 Lime-green illuminated hexagons aren’t exactly the first thing that comes to mind when you think of office ceilings! 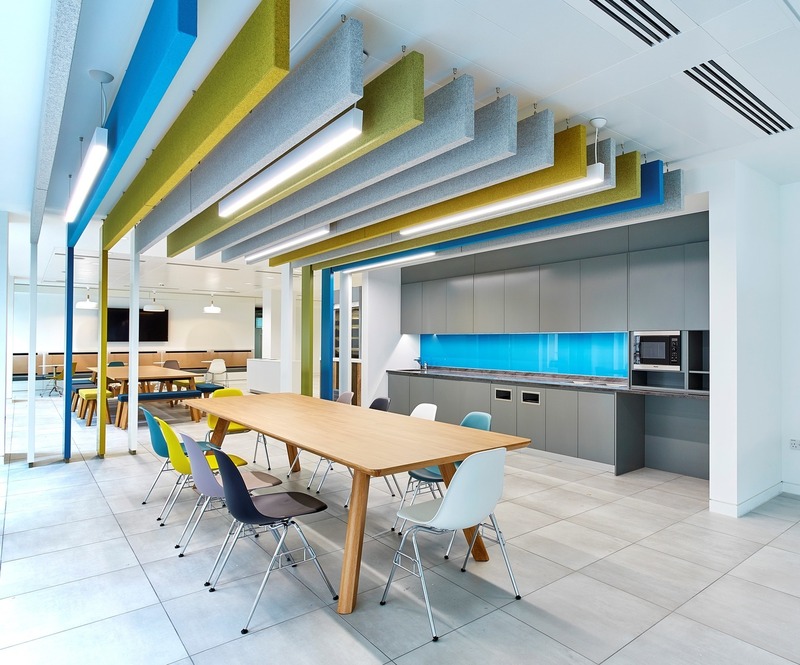 For Thales' Cambridge Office, a stimulating environment which promotes innovative thinking was the perfect finish to their collaboration zone. The design is visually arresting – lime green shapes against a contrasting black background, reflecting the hexagonal motif on the floor. These acoustic panels are functional as well as design-worthy, absorbing sound, and illuminating the collaboration benches below. Wood is a popular finish in office fit outs, due to its flexibility, wellbeing benefits and, because it looks great! 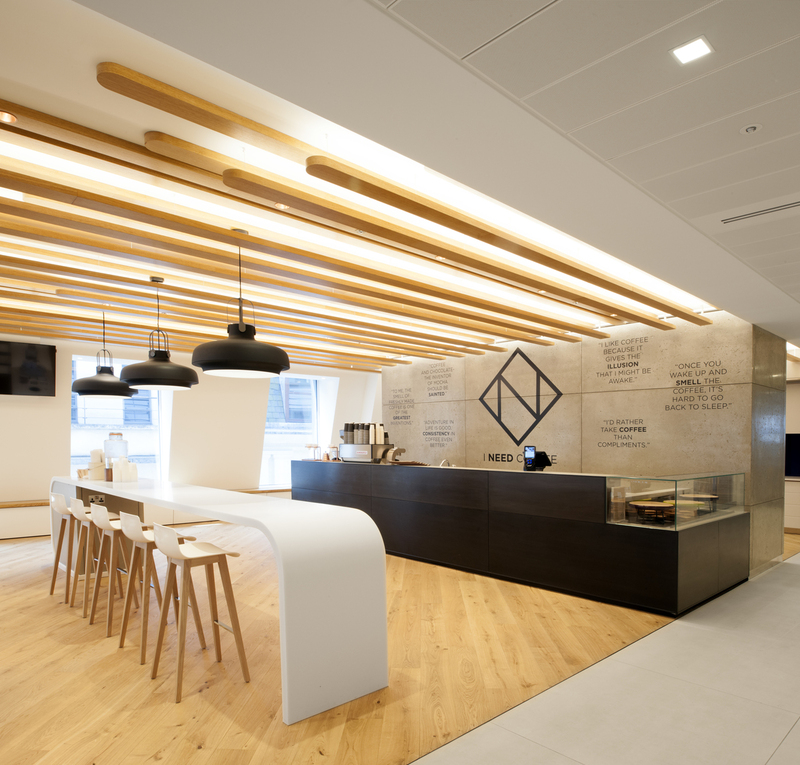 This celing joinery installation at ING Wholesale Bank delivers all these things. This layered look was achieved from balancing suspended beams on a lower level and attaching other beams to a bulkhead ceiling. The use of a bulkhead makes it easier to install the beams and electrics without the risk of damaging wires, pipes or cables. It also adds an additional sense of height and complements the wooden flooring and stone tiling used in this staff coffee bar. Sometimes offices are blessed with beautiful features, like this stunning coffered ceiling at the Canadian High Commission in London. 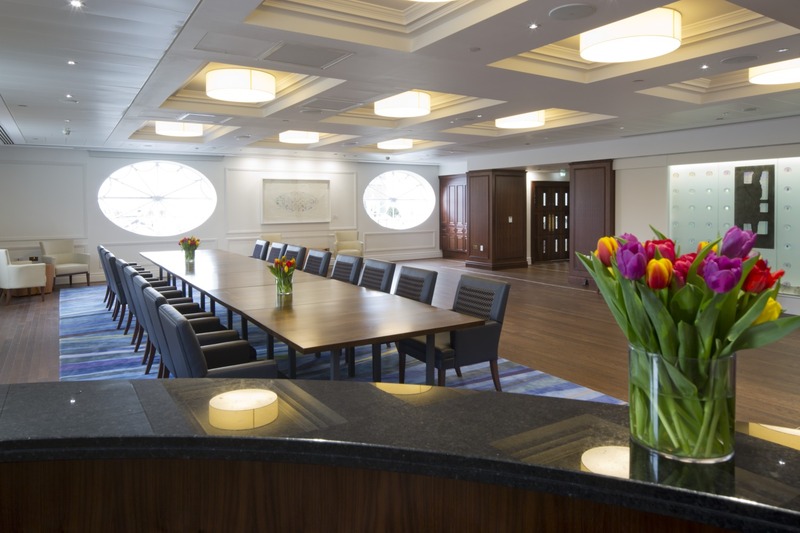 The challenge for modern office fit out is how to equip these traditional, period features with the functionality required for business use. Whilst the simple solution would be to insert a false ceiling with appropriate lighting and acoustics, this would lose the natural features of the ceiling. Instead sunken panels inside the waffled grid have been equipped with a modern, recessed lighting solution which maintains the integrity of the original ceiling. This takes careful planning when works are taking place, to ensure concealed elements like pipes or wires are not damaged or disturbed. Break away from the mundane and uniformity of a typical office ceiling by doing away with it altogether! At RocketSpace, the concrete structure of the building is the only ceiling they need. 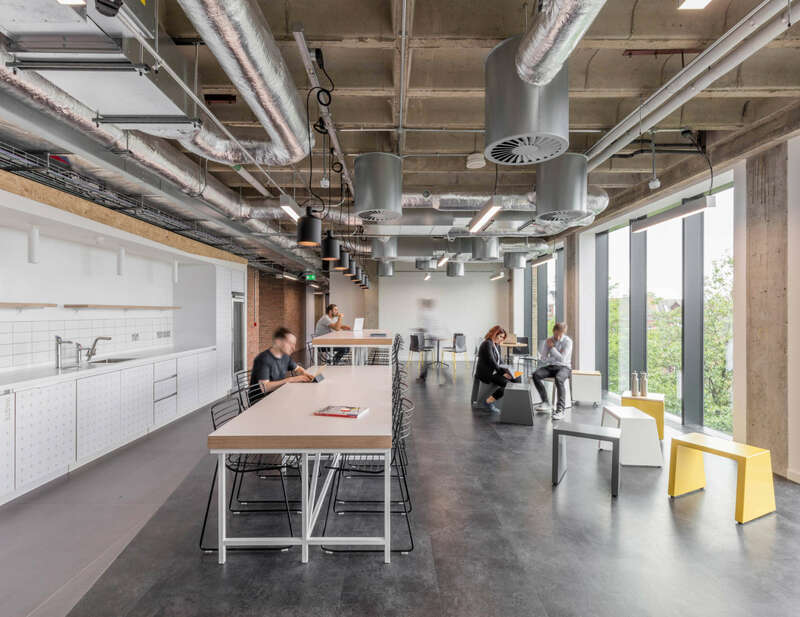 The exposed services give the space an urban edge whilst also offering the practicality of easily accessible pipes, wires and ventilation systems. Not having a false ceiling can allow you to allocate those funds elsewhere, and provides an opportunity to expose the thermal mass of a building which can in turn stabilise temperature fluctuations of a building. 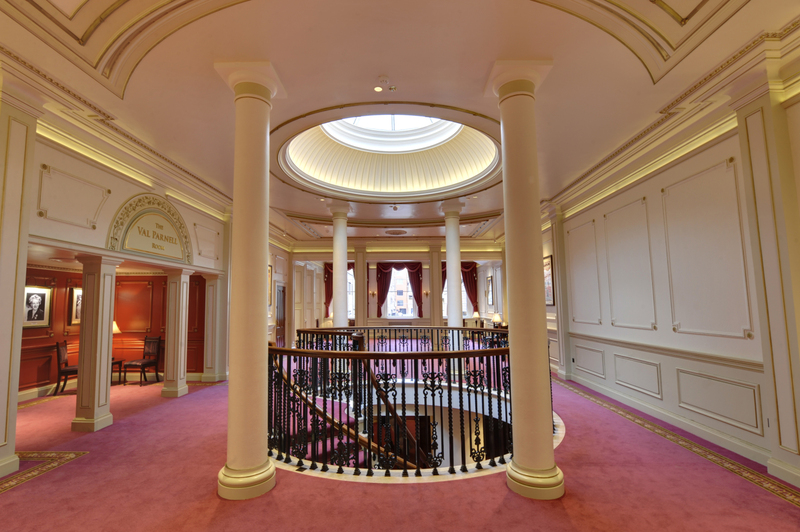 A cove, or dome ceiling, adds an incredible opulence to a space. At the time the London Palladium was built, this luxurious style of architecture was popular and gave visitors a sense of awe when they arrived. When we renovated the Palladium more recently, we were tasked with installing this new glass oculus into the cove ceiling. This complex task was entirely worth the effort – bringing natural light to the space and creating a beautiful feature that really is the star of the show!